Make a stunning impact wearing this arresting glossy green designer lehenga choli set featuring enticing zari & kundan accentuation enhancing the entire span of lehenga while the choli is done up in same work for a flabbergasting appeal! This lehenga choli set is accompanied with matching net dupatta with heavy zari motifs and embroidered border. 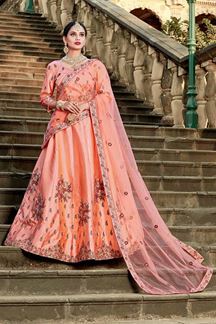 Note: Color may slightly vary due to digital photography.Length of choli comes of 13inches with work! Note: Color may slightly vary due to digital photography.